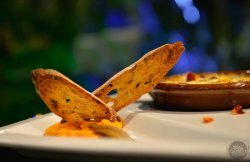 Meatless cuisine can taste equally delicious! 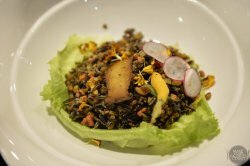 Quietly tucked on the rooftop garden of Orchard Central, Joie (pronounced 'Joy') has an interesting concept of specialising in meatless cuisine. 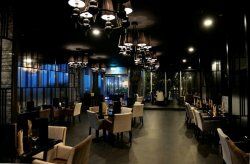 When I first heard meatless, I instantaneously thought of vegetarian or even vegan only to realise that is not the case as the restaurant uses dairy products in some of its dishes, especially the desserts. 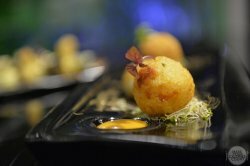 The meatless dining trend is in fact a lot more popular and prevalent in Europe and Taiwan, which focuses on natural fare prepared with the freshest vegetables, fruits and herbs. 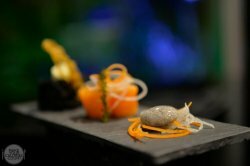 Offering a choice of a six-course lunch (S$38.80/++) or the seven-course dinner (S$68.80/++), one can expect contemporary dishes with a Japanese-European touch. 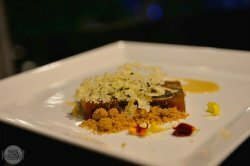 Can Executive Chef Sherwin Sim impress us and (make us full) with his meatless cuisine? 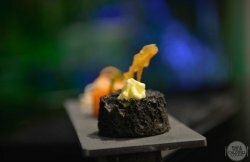 With the amuse bouche served at the chef's selection, we had the sesame soya milk sphere, carrot konnyaku and an interesting pistachio charcoal crumb. 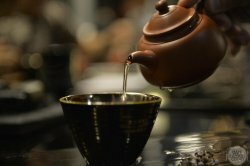 The sesame soya milk was delicately wrapped within, by an almost film-like thin bubble that burst with flavours and richness as I popped it into my mouth! In particular, the carrot konnyaku had a lovely rubbery and jelly-like texture. Lastly, the pistachio crumb tasted rather bland though I enjoyed the coarseness of the crumb which contrasted the other two elements served. The button mushrooms gratin was served with Tennessee heirloom potato puree and Belgian endive. 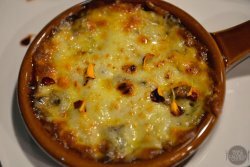 This dish fondly reminded me of the classic escargot dish generously covered with a rich layer of cheese and tucking in made me realised that button mushrooms made a perfect substitution! 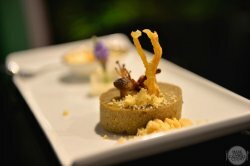 The steamed Japanese mushroom cake with rosemary gelee, golden enoki, vanilla creme and pistachio crumbs did not quite suit my palate. While the firm texture of the mushroom cake and the pistachio crumbs were good elements on the dish, the overall taste came across rather flat and bland. Quite frankly, I was never a fan of terrine though my last experience at Le Bistrot Du Sommelier was really memorable. While the firm but jelly-like texture of the terrine was palatable, I found the taste to be quite an acquired rendition led by aubergines, carrots, mushrooms and peppers drizzled with pistachio soil crumbs and a garlic-onion emulsion for an added punch of flavours. I found this to be a much more refreshing choice for my second course. 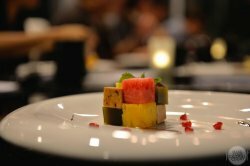 The red and yellow watermelon cubes with feta cheese, mint gelee had its flavours elevated by the refreshing burst of pomegranate seeds before the balsamic reduction harmoniously wraps up the dish. 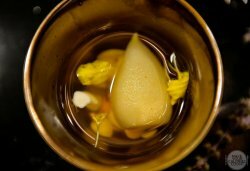 I loved how the dish was presented where we have to pour the double-boiled rich vegetable broth into the cup containing almond flakes and poached baby pear. The subtle yet flavoursome broth was everything you would ask for in a bowl of comfort soup, which fondly reminded me of my mum's cooking! The sauteed wild rice was served with baby radish, baby carrot and haricot verts. 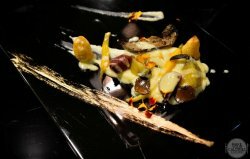 Each mouthful was a complex blend of textures and flavours as the added pine nuts also added a dimension of crunch. 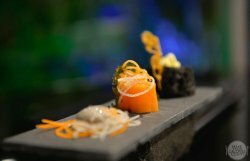 The dish tasted raw and clean, which perhaps explains the inspiration and name of the dish! If you are expecting soft or al dente texture for your rice, this would probably not suit your palate as this was slightly on the hard side. 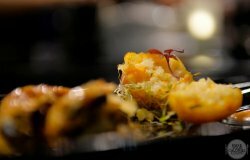 Beautifully decorated, golden baby beetroot with baby carrots, root vegetables, black truffle flakes and truffle mash, horseradish butter garlic sauce was almost an art piece to marvel. With plenty of ingredients and elements on the dish, it was the horseradish butter garlic sauce which took centerstage with its rich and dominating flavours. Not forgetting the soft carrots and golden and purple baby beetroots air-flown from Holland where the chef prepared via sous-vide provided the sweet touches to impress. 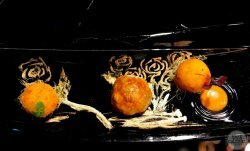 Taking a closer look, you would notice that the chef took extra effort to use edible gold paint to draw a picture involving the trio of spheres which included a fresh wild mushroom with truffle oil and onion in puff pastry, butternut pumpkin risotto ball with curry mayonnaise and crispy duo of mozzarella arancini. The curry mayonnaise took me by surprise as the bold flavours hit me instantly, in a pleasant way though. You cannot quite go wrong with these delicious golden-brown trios! Everyone was in awe when the gueridon trolley was pushed into our private dining room. 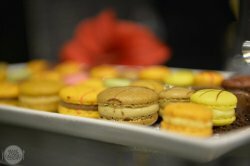 We had the privilege of choosing from an assortment of desserts ranging from macaroons, chocolates, cookies to candies! 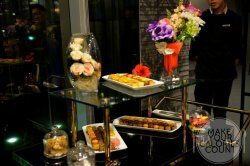 Choosing a fair mix of items, we thought that the desserts rightfully provided us with a sweet ending! 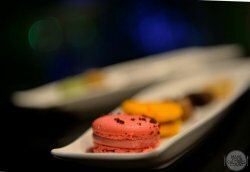 Paired with the desserts is a choice of a drink where one can choose from a range of teas, coffee and mocktails! 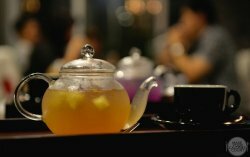 An invigorating blend of mallow flowers, apple and guava juice, it was indeed a refreshing drink to cleanse our palate! 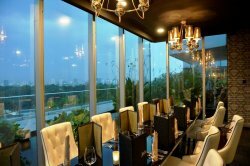 Overall, I love the creativity of the chef and more importantly his efforts in instilling aesthetics into his dishes. Not only did he glorify the natural ingredients comprising mainly the greens, we almost forgot that it was a meatless cuisine even till the end. With six courses, it was certainly more than enough to keep the gents filled not to mention the ladies! 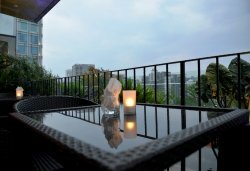 Located on the 12th floor with a rooftop garden, the outdoor seating would definitely be a lovely chill out spot in the evenings!